Today was moving day! 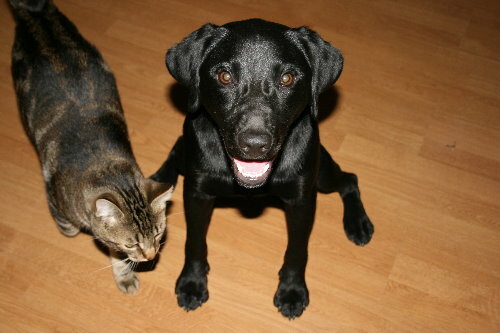 If everything went well (which, fingers crossed, it did), Raven is one happy puppy. The cats, most likely, are not so happy, but they’ll settle in quickly to their new surroundings. It will take Dan and I a little while to get completely unpacked and settled in, but once the last box is put away we’ll be happy, too. And I’ll especially be happy to return that truck to the rental office. At 26 feet, that thing is a beast! I couldn’t think of a catchy way to tie this in with the first photo, so I won’t. I found this insect at Rock Ridge this week. I’ve only ever seen one other, which I’d spotted at my parents’ old house in Halton County. It’s a scorpionfly (family Panorpidae), its name obviously taken from the similarity of the curled tail to the desert invertebrates. 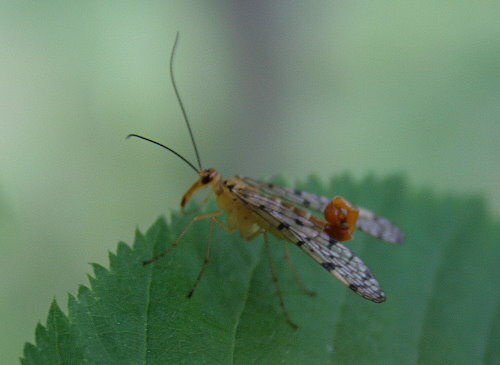 In North America, scorpionflies are only found in the east. Their habitat can be quite variable, from woodlands to grassy fields, often but not always near open water or seeps. They’re usually seen low, a few feet off the ground, resting on leaves. They use that long “beak” to scavenge dead or dying insects, though sometimes will take nectar from flowers. Despite their appearance, scorpionflies do not sting – the bulbous end to their curled tail is used in mating. Hoping that the moving did, indeed, go well.